Bihler of America will be just one of the companies on hand at FABTECH Canada 2018, featuring some of the latest equipment and technology in the industrial processing sector. Running June 12-14 at the Toronto Congress Centre, it will be the first time for Bihler to exhibit at the show, where they will be featuring their newest slide forming machine. For metal stampers that are producing high volume parts with critical forming features, such as auto body clips and snaps, the Bihler 4 Slide-NC provides one solution, namely in terms of speed, performance, and intuitive controls. “Customers are realizing run rates that are as much as six times faster than previous generation machines,” said Linder. One recent buyer of the Bihler 4 Slide-NC, a producer of clips and fasteners for the automotive industry, was able to phase out six existing machines for each newly installed 4 Slide-NC, while increasing output rates by an impressive six fold. 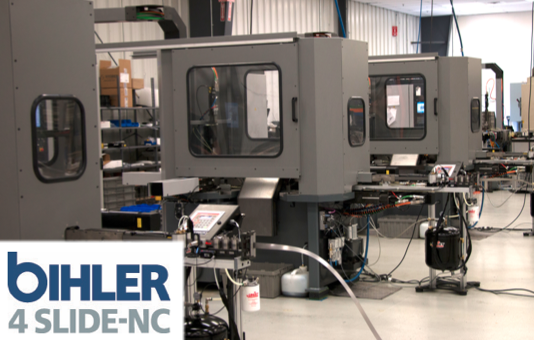 Another customer was able to immediately replace four older slide-forming machines with one new Bihler 4 Slide-NC. Linder referenced yet another customer that actually halted plans for a facility expansion due to the reduction in the overall physical space required when one new 4 Slide-NC machine can outperform the collective productivity of multiple older slide forming machines. The new 4 Slide-NC machines can run millions of parts without needing a single adjustment; they stay in tolerance for the entire duration of a large volume production run. One of the most appreciated attributes of the new Bihler machine is its digital control panel. This easy-to-use interface allows an operator to completely regulate the production process and automation tasks simply and quickly. In a time when many manufacturers are focused on attracting new, young talent to their teams, a tech-centric machine like the Bihler 4 Slide-NC is more appealing and readily adoptable by a generation of workers that literally grew up in a digital world. CN planning to transport crude at "very favourable pricing"